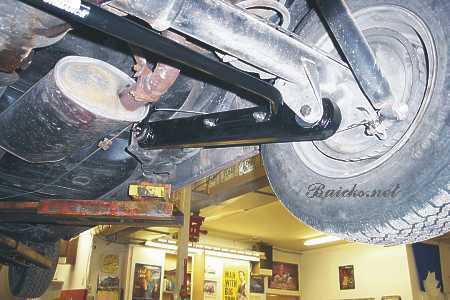 I have already upgraded my front sway bar HERE. Do not attempt any projects that you are not fully qualified to build and use! This article shows what I did 'til the time of writing, and suggestions on improving on the project. I like the last one! I don't like the price on the last one!... :( After having a look at better after market trailing arms, I think I'll have a go at building a set. I had a look at some pictures of some after market arms, they appeared to be a piece of rectangular tubing about 1" by 3". The specs on the ads were .120 wall. I went down and bought a piece of 1x3 with .125 wall. 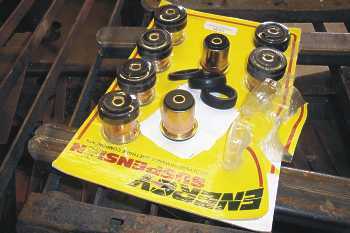 I bought a Polyurethane bushing kit from Energy Suspension #3.3132G. It is a set with uppers and lowers. This kit supplies you with outer steel shells suitable for replacing the original bushings in the OEM arms. Rather than building bushings like I did, I would suggest that you will want the outer shells for welding into the arms. Could save a bunch of time! The bushing holes in the original bars are centered at 22". 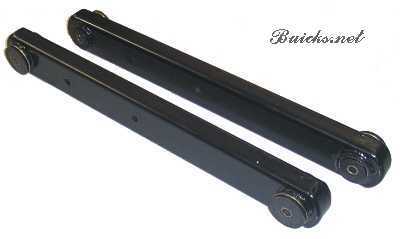 The holes for mounting the sway bar are centered 4 5/8" and 10 5/8" from the bushing. Your accurate layout and drilling is the key to being happy with your product, so do it carefully. While I drilled the holes for the bushing sleeves, I don't see why you couldn't cut them with a torch, then carefully set them up on a suitable flat surface and tach them carefully in place, then weld. As you can see, I built a set of bushing to press the kit bushing into, much like the OEM. I don't see any need for this. I think you could just disassemble the new bushing and weld the steel bushing supplied into place. This method would mean you would not have to do any lathe work for the project. Weld 1/2" pipe into the sway bar mounting holes then dress them up with a drill and grind flush. These greasing instructions are generally considered adequate for replacing OEM bushings with poly bushings. Grease fittings are not recommended. You will also notice that I have not installed any grease system. The replacement kit I purchased only suggests that you grease them during installation. If they squeak and bother me, I will have to retrofit a grease fitting. When I build the uppers, I will put grease fittings in during construction. But I still don't have a posi!! !